Beautiful 2 Story Townhome - Great Value! This beautifully decorated 3 bedroom – 2 bath townhome is located at Hidden Valley Four Seasons Resort. The first floor has 1 bedroom with a queen bed and full bath. The kitchen is fully stocked, has bar seating at the counter and the dining room table opens to seat 8 comfortably. The living room is open to the 2nd floor with a stone fireplace. The couch also opens to a sofa bed. The second floor has 2 bedrooms. 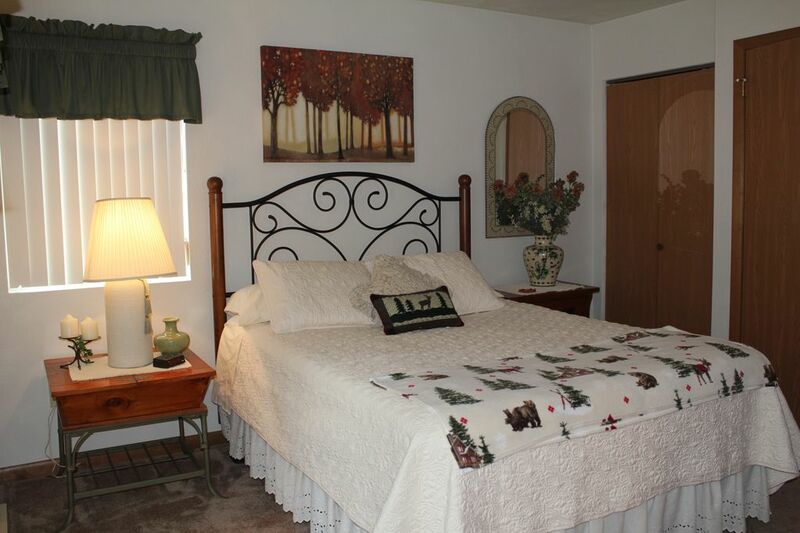 The Master has a queen bed, the 2nd bedroom has twin beds with a pull-out trundle. The large master bath has a shower and jacuzzi tub. This unit has cable tv and wi-fi. It is also fully furnished with bedding, linens, towels and firewood. An apartment sized washer/dryer combo is available for your use. The deck off of the dining room has seating and a gas grill. There are 2 ponds in the back of this unit that are perfect for the little ones to fish! This unit is 1 block away from the top of the ski lift, it is easy on & off the slopes. Along with being within walking distance to the slopes, this townhome is located by convenient walkways to beautiful lakes and fountains. The Hidden Valley Golf Club is only ¼ mile from the townhouse. This is a par-72, 6,589 yard 18-hole layout. This championship golf course is rated among the top 5 in Pennsylvania. Enjoy lunch or dinner at Mulligan’s Grill located at the course. Shuttle transportation is available during the ski season that can take you to the bottom of the slopes to the Main Lodge, Spa & Fitness Center, and Glaciers Pub. We are a local family and spent many weekends at Hidden Valley with our children. It is a perfect setting for families. We fell in love with the Resort and purchased our own special get-away. This property is very convenient to the slopes. The top of the mountain is just across the road and the ski lift is right there for easy on/off the mountain. It is also about 1 block distance to the Golf Course. Pools and Tennis courts are a short walk around the corner! Everyone is happy!!! There is a pond in the back that is perfect for catching fish, tadpoles and frogs. 2 Story - stone wood burning fireplace, wood is provided. Available at the Spa & Fitness Center at the bottom of the mountains. The living room has a pull out sofa bed. The kitchen is fully stocked with everything you need to enjoy many fine dinners. All stainless steel appliances. Large dining room table opens to accommodate 8 comfortably. Additional Seating for 4 at Kitchen counter. An assortment of books are available for easy reading at the pool or in front of the fire. Some puzzles and games are available for use. Several children's toys are available. Available to rent at Resort. Boating available at nearby lakes. Relax on the deck after a day of golfing. Tennis courts are a short walk away! Hidden Valley Golf Course is approximately 1/4 mile from townhome. The first floor has a bedroom with a queen bed and bathroom. Located at Spa & Fitness Center. 2 outdoor pools are on resort property and within walking distance from townhome. Hot tubs are located at Spa & Fitness Center. This property is fantastically located next to Forbes State Park with miles of hiking trails and countless resort offerings. Hidden Valley is Pennsylvania's Premier Four Season Resort. Enjoy the 25 ski slopes & trails, a five-star 18 hole championship golf course rated in the top 5 in PA, 3 heated swimming pools, 30 miles of hiking & biking trails, the Spa & Fitness Center, turbo snow-tubing, tennis courts, sleigh rides, hay rides, play ground & lighted basketball courts. You will be just minutes to Forbes State Park where you can hike or bike the trails of Kooser, Laurel Run, Linn Run, Laurel Summit State Parks and the Great Allegheny Passage Trail Head. Also enjoy fishing or swimming at the beaches of these State Parks. You are also located just a few minutes away from Seven Springs Golf Course and Ski Resort. You can enjoy playing two different World renowned Professional 18 hole Golf Courses in the same vacation stay. Enjoy both Ski Mountains in the same day also! I stayed at this townhome for a relaxing weekend with family . We absolutely loved it and will definitely be back. The owner is very nice and gets back to you in a timely manner. The moment you walk in the townhome makes you feel very welcoming and cozy. The pond behind the home and the patio was very relaxing in the mornings. The place is very very clean and well taken care of . Everything you need is there for you. My family and I will definitely stay here again! Very relaxing place for a weekend getaway! We shared the townhouse with relatives and it was perfect for 4 adults and 4 small children. It was very clean and comfortable. Everything was provided - dish soap, towels, sheets, garbage bags, etc. which made it great! It was nice to have a washer and dryer in the house. The kids took advantage of the toys and games in the house as well. They enjoyed fishing in the pond out back, playing at the playground by the Foundation Office and walking around Hidden Valley. It is a quick and easy drive to get to the State Park and other hiking trails. Would definitely recommend and look forward to staying again in the future! The owners are great and very communicative and helpful. We had a very nice stay. The property was beautiful, clean and well taken care of. The pound behind the house enjoyable as well. Plenty of room in yard for kids to play.. Wonderful Memorial Day Weekend Stay. This lovely townhouse suited us Girls just fine! This home is quite comfortable and very clean. The kitchen has all the amenities for cooking. The grounds where beautiful for walking. The nearby Wineries were a added bonus. We had a great time and are looking forward to another great stay here. Angela, I am so happy you enjoyed your stay. Please visit again, we offer discounts for repeat visits. Had a fabulous weekend with friends for golf and relaxation! The townhouse was very clean and the kitchen had everything we needed to cook with! The weather was perfect and we all sat outside in the evenings talking and catching up. The Hidden Valley golf course was literally right around the corner! Had a great time and loved the location.